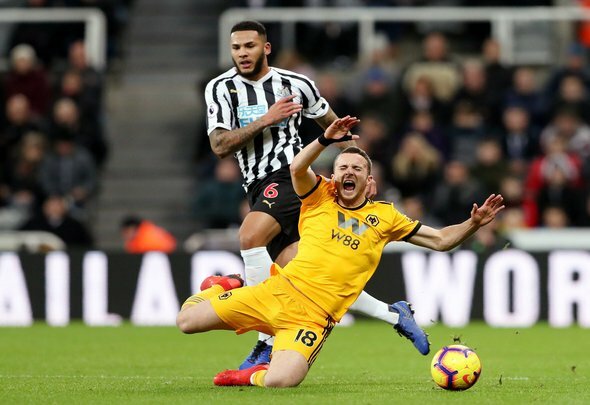 Newcastle United looked a tough side to break down on Monday night but one man who looked like he would be able to make the difference was Diogo Jota. The Portuguese star tormented DeAndre Yedlin from start to finish and he was unlucky not to see the gulf in quality between the pair result in more fortune for him and his teammates. For someone of his stature he showed immense strength to keep off the Newcastle midfield and defenders and having struggled to impose himself early on in the season there was no fear of a stiff breeze blowing him over. He will not find it as easy to dominate other defenders in the league, Yedlin having a particularly poor day at the office, and so Jota has to improve on his final ball and decision making but it should take nothing away from his performance against the Magpies. At the end of the day, he made an international defender look bang average over and over again and that is all the Molineux faithful can ask for. Jota's upper body strength is remarkable. Also, god help us if they score first..
Not saying "we need a new striker" because Jota and Jiminez are magnificent, BUT we HAVE to be more clinical. We had this game by the scruff of the neck for the first 30 min, but wasted too many opportunities. Really poor goal to concede considering Wolves were all over them first half. Gotta stretch them, cause them problems. Jota is doing his best.